Seeing children as a gift, not a carefully managed asset. Eight years ago, I was chatting with a friend, also named Jenny, at a quaint café in Westchester, New York. The memory takes on a dreamlike quality, because we were single then—married, I mean, but unencumbered by wee ones. No car seats to tangle with, no squawking nurslings, no checklist required for a simple outing. Self, check. Purse, check. Buddy, check. Ahhhh, the simple life: we could finish our coffee and our sentences. But then Jenny betrayed me, during that very conversation with the long lingering sentences and slow sips of latté. She said, "I think we're going to start trying for a baby." Just like that, she rejected the premise I assumed we shared: that you should have absolutely everything in order before you even think about conceiving. Both of our husbands were seminary students at the time, and we were barely squeaking by. But Jenny didn't assess her situation in purely economic terms. "I'm almost thirty now," she said, "If I want to have more than one, it is time to start." Jenny and I, still in our twenties, were in the springtime of our lives, and I didn't even realize it. 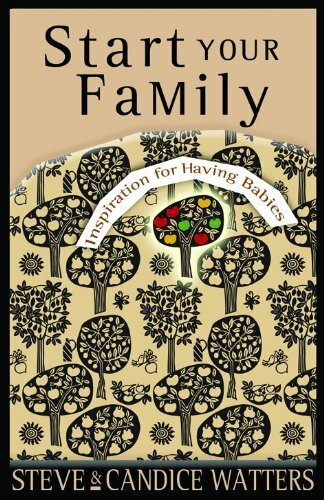 I see it more clearly in hindsight, especially after reading Start Your Family: Inspiration for Having Babies by Steve and Candice Watters. Currently, many of us spend the springtime completing our education and establishing our careers. These are worthy endeavors, but perhaps we give them too much priority. Springtime is a short season of peak fertility, stamina, and flexibility—an ideal time to have children if possible. Jenny realized that spring would soon give way to summer. Whatever other concerns loomed, biology was on our side, and it wouldn't be forever. As the Watters write, "Regardless of perceptions of our potential, and the steady stream of technological breakthroughs—our bodies stubbornly grow less conducive to conceiving, gestating and caring for babies the older we get." I should say that most of my friends (like the Watters themselves) have borne most of their children during the summer—in their thirties. Life situations can push our childbearing years back, and sometimes it is wise to wait. But the Watters make a reasonable point when they say that our generation is unlike the ones that preceded us, and they do not mean this as a compliment. Most of us don't welcome children when our bodies are most ready to bear them. Instead, we plan, we prioritize, we travel the world and advance in our careers before we'll even broach the subject. All this self-actualization is not a bad thing, but the model has some weaknesses, even if we do achieve pre-conception success and success at conception. "No longer are bedrooms crammed with bunk beds and toy chests," The Watters write. "The suburbs, once a haven for flourishing families, now boast spacious homes filled with exercise equipment, computers and craft supplies … . It's ironic that couples can be so driven to provide everything to make a child's life materially rich, that in the process they make scarce the one thing a child needs most—their time." The Watters suggest that you don't have to have a water-tight plan or the funds for a Pottery Barn Nursery to begin the process of conception. Just begin. Begin where you are, Begin with hope: that's the message. Start Your Family is not a pregnancy manual or a preconception checkbook. It is a guide through the emotional, financial, and spiritual geography surrounding the choice to procreate. The Watters talk about the choices they wish they'd made differently as well the struggles and joys they experience daily as the parents of four children. I would like to buy Start Your Family for every Christian couple I know—newlyweds as well as seasoned parents, weary like me, who want to remember the goodness and gift of children in the midst of their daily struggles. I also wish every pastor had a stack on hand, so that he could give a copy to couples as part of their premarital counseling. Those who chose to conceive must walk through the shadow of doubt, and some will face the cave of infertility or the grave of miscarriage. The joyous gift of conception is often tempered by a series of confusing tests and screenings offered by the OBGYN, even if you have no desire to terminate. It's a fearful threshold—from preconception to pregnancy to birth. Perhaps we know too much about what can go wrong, but we're not yet sure how God can work in the midst of it all. This is where the Watters' book shines: it offers couples permission to take the leap their parents and grandparents took before them, but not blindly. Start Your Family does not gloss over the trials that come with parenthood—the daily "sludge" of a life that some might be tempted to idealize.